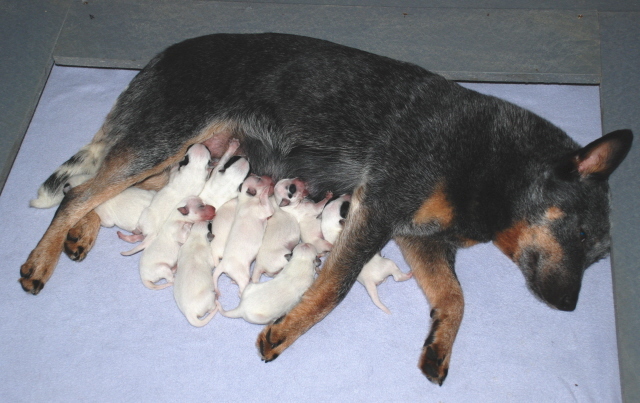 All Australian Cattle Dog puppies are born white. The only markings you will see are eye, ear or tail patches. Body spots are acceptable, but not preferred. As the weeks progress the colours will start to show through their white coats. Usually by two to three weeks of age you will really start to see the colours come through. There are two main colours, blue and red. Variations to these colours include mottling and speckling. Plans are to breed Billie the Fall of 2018, please contact us directly for more information. Billie pictured with her co-owner Cindy Cavanagh. 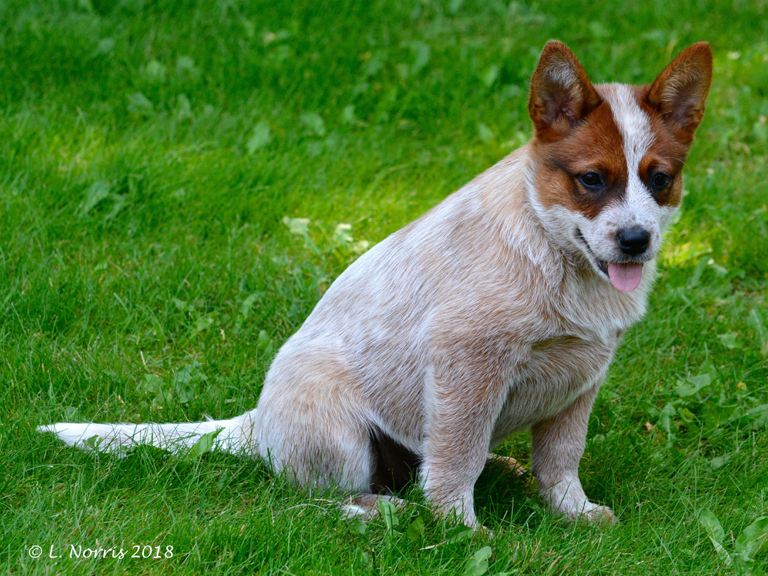 Chris Simpson of Arrunga Kennel (official kennel name pending CKC approval) has a red male and red female available. Litter is Canadian Kennel Club registered, current on shots, dewormed, vet checked, both tested for hearing normal. See Chris' contact information to the right. At Agassiz we take pride in breeding and raising our canine companions. We carefully plan our breedings. 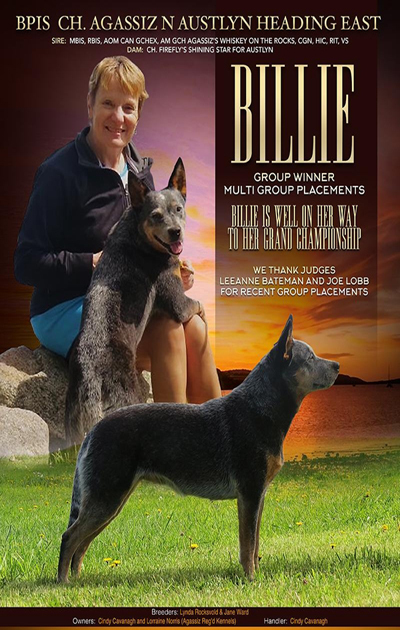 All our breeding dogs are selectively chosen, striving to achieve and work towards preserving the integrity of the purebred Australian Cattle Dog. We are dedicated to helping others and ensure that all our puppies are placed in caring and loving homes. Our pups are raised with lots of love and are well socialized. Owning a dog is a long term commitment and all prospective puppy clients must respect our advice and answer lots of questions! 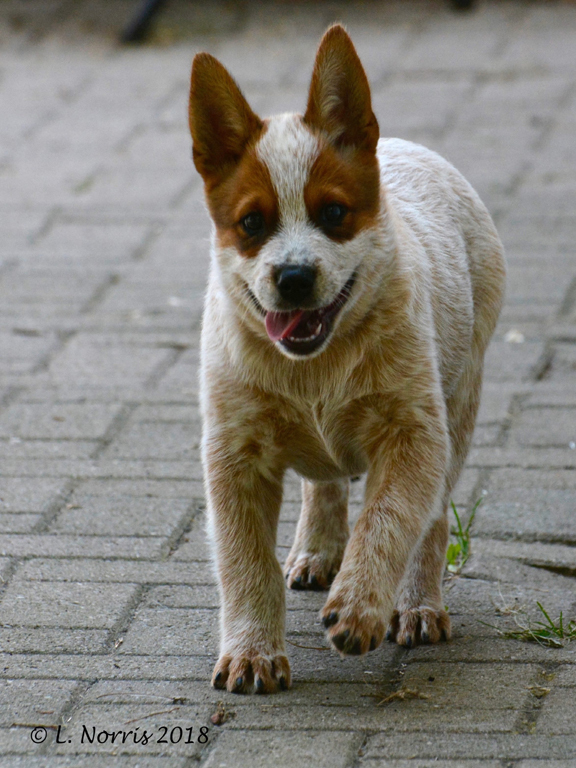 We offer very limited stud services and we only allow our studs to be bred to purebred, registered (CKC, AKC or other recognized affiliations) Australian Cattle Dogs that have authorized breeding rights and required health clearances. Our breeding dogs have had health clearances for hearing (BAER), hips (OVC or OFA certification) and eyes (CERF or PRA and PLL DNA tested). Since the DNA testing is now available for the genetic determination of Progressive Retinal Atrophy (prcd and rcd4), we will only now breed dogs that will either produce clear or carriers of the eye abnormality. We will not knowingly breed any dogs that may produce the disease. A carrier will not become an affected dog. Pups are released to their new homes at about 8 weeks old. Before placed, pups have dewclaws removed, vet checked, dewormed, hearing tested, microchipped and first set of puppy shots. Our ACDs have a natural tails - no docking. Pups are sent home with a comprehensive puppy package, including medical record, feeding and vaccination schedule, puppy toys, leash, collar, biscuits, food, blanket, etc. Before six months of age, pups will be registered with the Canadian Kennel Club (CKC), a pedigree is provided. All pups are sold on a Non Breeding Contract, filed with the CKC. If purchased for showing or breeding, this contract may be lifted at the owner's expense. We take our non breeding contract very seriously. We do not allow any dogs from our kennel to be cross bred with another breed. Please click this link to read our purchase agreement. Contract. Our contract also outlines our specific health guarantee. A deposit is required to hold a reservation for a pup. Dogs sold for breeding must comply with certain conditions, as we like to remind others that breeding dogs is a huge commitment and requires lots of time, patience and support. You must be committed that if a pup is born and sold under your care, then you have to be prepared if something goes wrong to mitigate the problem, possibly taking the dog back. It takes a long time to establish a good breeding program with lots research. There are way too many "backyard" breeders, ultimately many of those dogs are found in rescues (or worse situations) and possibly have health issues that could have been avoided. If you are considering breeding, think about it seriously, don't just jump into "collecting" dogs. Find mentors (not just an ACD breeder), people that will honestly tell you that sometimes the "trials" far exceeds the "tribulations". On occasion we may have an older dog that is available to be placed in an approved home. Please call us for details. We never have pups available at the winter holiday season, please reconsider buying any pup around Christmas time. Life is way too busy that time of year and buying one on impulse as a gift often is not a good idea. Send us an e-mail or give us a call if you would like more information about the planned breedings. We sometimes get very busy around here, so if we don't respond via e-mail right away, please don't hesitate to give us a call.